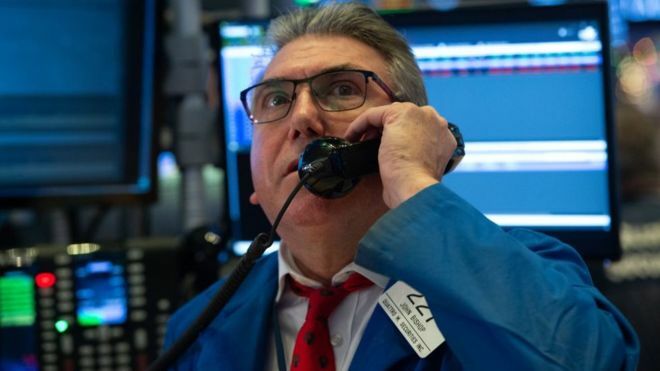 International Desk: US stocks suffered one of the worst weekly falls in a decade as trade tensions with China, interest rate rises and a possible government shutdown rattled markets. All three indexes closed lower, with the technology-focused Nasdaq down 20% since its peak, placing it in so-called "bear market" territory. The Dow Jones Industrial Average recorded its biggest weekly drop in percentage terms since 2008. The S&P 500 fell 7% for the week. It is the biggest weekly percentage drop since August 2011 while the Nasdaq's 8.36% decline is the sharpest since November 2008. The Dow Jones fell 6.8% during the week. After years of gains, US investors are fleeing stocks, worried about a range of factors likely to hit corporate profits, including slowing economic growth domestically and abroad. Earlier this week, the US Federal Reserve lifted the interest rate and signalled that it would continue to rise next year, albeit at a slower pace. The Fed also cut its forecasts for economic growth in 2019 to 2.3%, down from the 2.5% predicted in September. Michael Hewson, chief markets analyst at CMC Markets, said: "China is cooling and the eurozone is slowing down, and some of the economic indicators from the US have been a bit soft recently, but yet the Fed hiked rates and suggested that two more interest rate hikes were lined up for 2019." Elliot Clarke, economist at Westpac, the banking group, added: "Political brinkmanship in Washington is further heightening market uncertainty." Markets were also unnerved by comments from President Donald Trump's trade adviser Peter Navarro who told the Nikkei newspaper that it would be "difficult" for the US and China to reach a long lasting trade agreement that would end the tensions between the two. Share trading started Friday on an upswing, boosted by stronger-than-expected quarterly sales at sportswear giant Nike. Investors also appeared soothed after John Williams, president and chief executive of the Federal Reserve Bank of New York said the central bank would consider market turmoil as it weighs future interest rate decisions.